Frameless glass railings systems are synonymous with sophistication. Celebrated Toronto buildings like The Eaton Centre and CN Tower, all incorporate glass railings into their internal and external architecture. The result is a distinctive aesthetic feel which adds elegance and value. Tempered glass is one of the world’s newest architectural materials. Invented In the early 20th Century by Rudolf Seiden, tempered glass is far stronger than conventional glass. However, up until the 1980’s, frameless glass was used exclusively in commercial contexts. Thankfully, glass railing designs today can be found in company headquarters, offices, and a wide variety of Toronto residences. Adding a glass railing to a home, is a fantastic way to add space, light, and added market value. Commonly used materials in staircase railings & decks stairs include aluminum , wood, and wrought iron. However, materials like the aforementioned are restrictive in terms of how they integrate with existing architecture. Frameless glass isn’t. 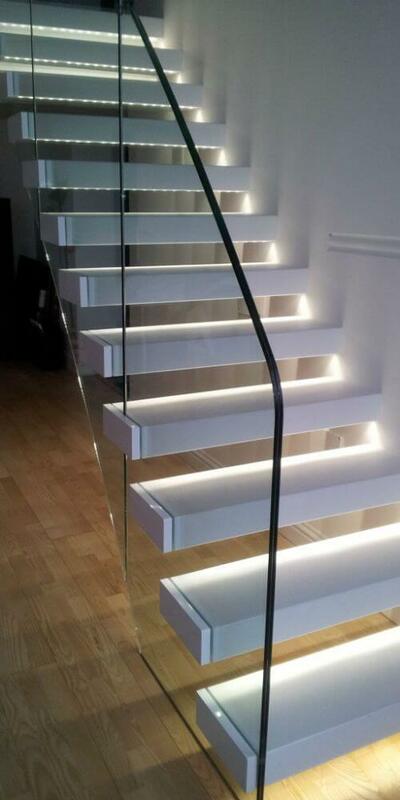 As well as being versatile and easy to customize, a glass railing or staircase can transform how light diffuses. With the right glass railing, even historic building interiors can be equipped with a clean, minimalist, and ultra-modern aesthetic. This is thanks to the fact that glass railings remove visible barriers between interior home areas. Much more importantly, increased natural light results in significant health and well-being benefits for homeowners. As a go-to frameless glass company in Toronto, we are regularly called upon to fabricate outdoor glass railing and balcony surrounds. In rural and suburban contexts, outdoor glass railings are prized for their ability to provide expansive garden views. In fact, frameless glass is currently the material of choice for property developers when constructing contemporary home decks and verandas. City condominiums meanwhile, can be transformed by glass railings, into brighter properties with breathtaking views and increased urban living appeal. A wrap-around glass railing or balcony is always strikingly beautiful. However, tempered glass is also highly durable. With tempered glass, property owners don’t have to worry about galvanic corrosion, oxidation, or materials like wood degrading. Railing and balcony panels will last for decades; possibly even centuries after installation. Frameless glass is one of the most versatile construction materials to work with. However, for best aesthetic results, homeowners should always work with trusted contractors like ourselves. During our project discovery process, you tell us exactly what kind of glass railing design you have in mind. We then identify what designs will best complement existing property architecture. Before residential construction of staircases and balconies, we also allow you to choose from a variety of different customization options. Whether you want to impress visitors or add market value to a property, we can help. We offer completely transparent pricing, and our design teams are always on hand to answer customer questions. This being the case, if you are looking to transform the aesthetics of your property, make sure to call today for more information.